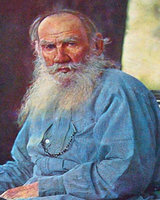 Leo Tolstoy 9 September 1828 20 November 1910 Russian Nikolai Ilyich Tolstoy Mariya Tolstaya Author, Playwright, Essayist, Novelist, Philosopher Russian writer who is regarded as one of the greatest authors of all time. He is best-known for the novels War and Peace(1869) and Anna Karenina(1877), his fictions includes dozens of short stories and several novellas such as The Death of Ivan Ilyich, Family Happiness and Hadji Murad. He wrote plays and numerous philosophical essays. A list of popular leo tolstoy quotes are given below.